We as internet retailers focus a lot on the acquisition of new customers. However it’s 7 times more expensive to secure a new customer than to retain an existing one. 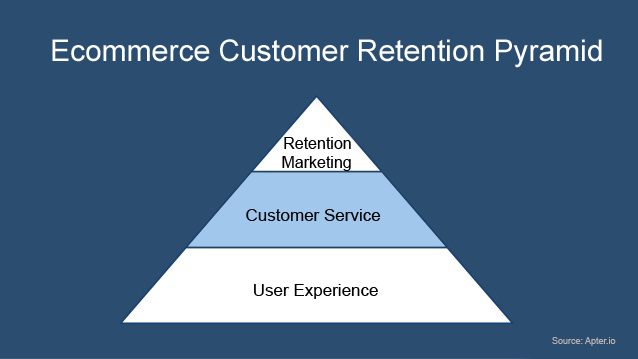 Moreover, many ecommerce merchants don’t have any real customer retention strategy. Social media activities and regular email newsletters are not how customer retention works. It is a longer process, affordable to any small-medium online store, which could give very profitable results. So we are taking a serious look at it and publishing this ultimate step-by-step guide to small-medium ecommerce customer retention. When users first jump into the website, they experience its design and usability. None of the retention marketing or customer service activities are meaningful until the user starts to make a purchasing decision. When a user has found a product, read the description, compared it with the competition, and added it to a basket, only then will customer service start to receive enquiries. Until that point, smooth and easy usability is the key to your ecommerce business success. It’s like coming to a restaurant for a lunch when you are freaking hungry, and realizing that you’ll need to wait an hour for a seat. You become frustrated and go to another restaurant because your time is precious – regardless of how awesome the food is or how beautiful the waitress is. That’s why a great user experience is the base of all customer retention processes. Homepage. Large and Ever-Present Search Box. It should be always there when users need to find a product. As your goal is to sell a product, you should be helping users to find a desirable product and then make them buy it. Usually search is used by people with a high intent to buy as they know what they are looking for. 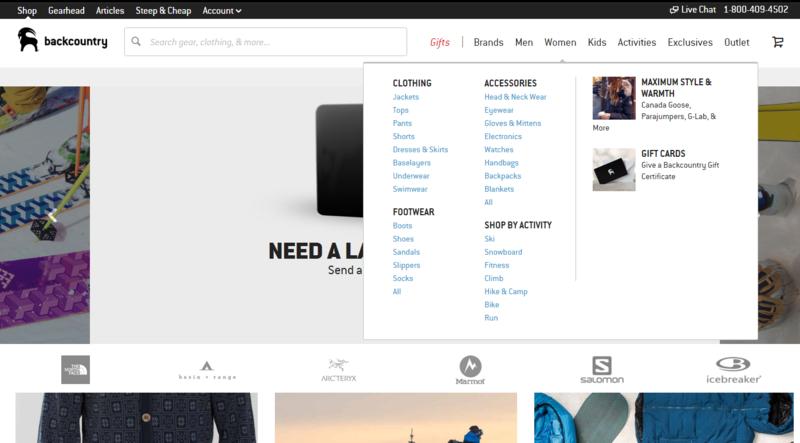 Some users arrive without knowing what product they want to purchase and just want to look around; they often choose to browse using the navigation bar. Place it there where users expect to find it – horizontally on top or vertically on the left. Use browsing history for personalization. 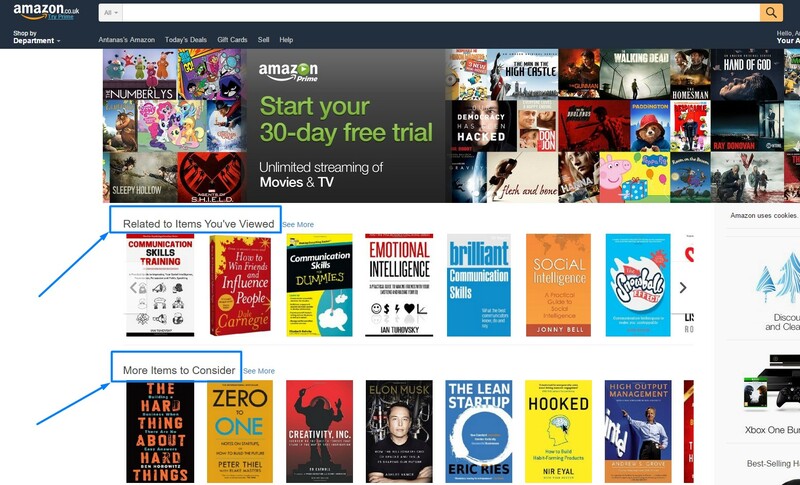 One of the most famous retailers using personalization on their homepage is Amazon. We all know that discounted products strongly attract users. Special price offers should be easily identifiable: line them up in a section for users who are seeking a “great offer” or simply a discount. Users don’t blindly trust all the badges. Select a maximum of three well-known trust-badges which your users can easily identify. If you place them in the right place and increase credibility, then trust badges could give an ecommerce site a really great conversion uplift. If you or your product has ever been in the press, it’s a great opportunity for raising your ecommerce site’s credibility. Make sure your users know the portal because it is not going to make any sense if you state that you have been mentioned by some unknown website. If you sell furniture and you have been featured by some famous furniture blog or news portal – that should work well. Moreover, famous portals like Econsultancy, InternetRetailer, Techcrunch or any other often works well for many audiences and niches. First-time visitors often eye a new website with a hint of suspicion. You’ve got to prove that this online store is not a scam, it’s safe to purchase and that you are a real company. If you are offering free shipping, announce it clearly. It’s a great value proposition and a tool for purchasing persuasion. It’s simple: People come wanting to buy, so they need to find the product first. People are used to operating a search function and expect the same experience as Google or Amazon. So to achieve great conversions and make customers come back to buy again, they must be able to find products easily. You can’t control how people name products. The product could be named “Writing table” but a user could search for “Writer’s desk”. Moreover, the search query could have even more information like “black writing table for children” and you should be able to generate relevant results from this. Also, make sure your search function can understand synonyms (desk – table). We are all familiar with autocomplete. It’s probably because Auto-Suggestions are Found On 82% Of Websites. But if not implemented carefully it can do more harm than good. It’s better not to have an autocomplete than to have a poor one with irrelevant content. We at SearchNode are seeing various cases where people using autocomplete convert three times better than users not using it. Some of the clients have even reached a conversion rate of double digits XY.XY% after using autocomplete. So get a beautiful user-friendly autocomplete design, generate relevant keywords, products, and suggestions and let your users enjoy – while you enjoy great conversion and retention stats. Search without spellcheck directly increases the chances of getting 0 results. Zero results to a user means that you don’t have such a product and you simply lose a potential customer as a result. Spellcheck is mostly used with more sophisticated words, brand names and on mobile. In our experience at SearchNode 9% of all searches are corrected by spellcheck. If they were not corrected, our clients would have lost those customers, but instead, they generated sales. Filtering and sorting are essential ways that people use to find the right product among the results. They usually do not specify all the attributes in the search query because they are still not completely decided on what product to buy. The ability to modify search results is a powerful tool allowing the user to quickly decide on what to buy. If I search for a “writing table” and I get 150 results it is tough to select just one. But when I am able to select some relevant attributes like material, color, size, price and brand, then it’s really easy to select a product to buy. Sometimes users search for a product, but you don’t have it. A zero results page is a direct way for users to exit the website. So you need to have a solution in this case. One of the best ways is to apologize (discount or coupon works best here) and offer some similar products. 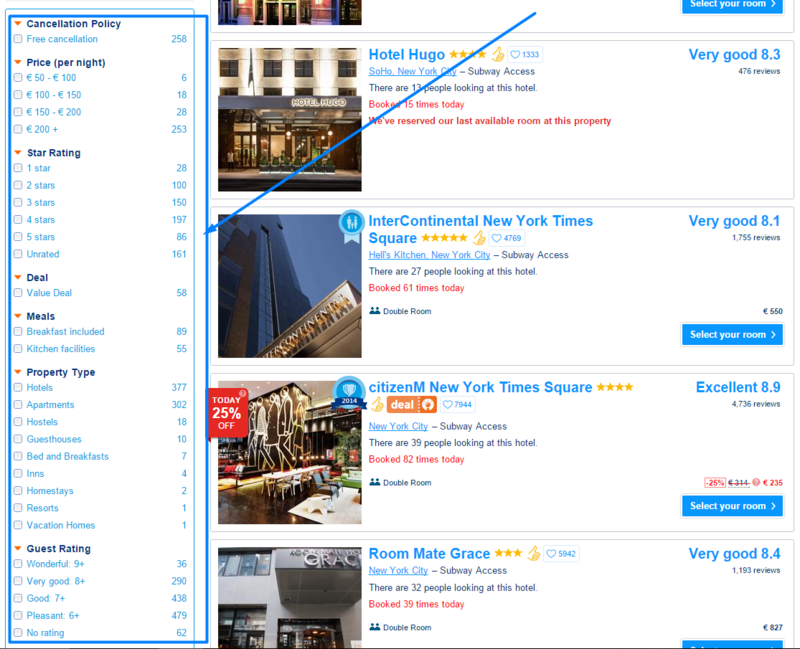 Those users who have a lower intent to buy use navigation compared to those who use the search box. However, it is still a very important feature as product findability is key to any ecommerce business. Moreover, knowing that at least 25% of visitors use a navigation bar, we must serve them well too. Remember, users will come back again if it has been easy to browse and buy at your website. 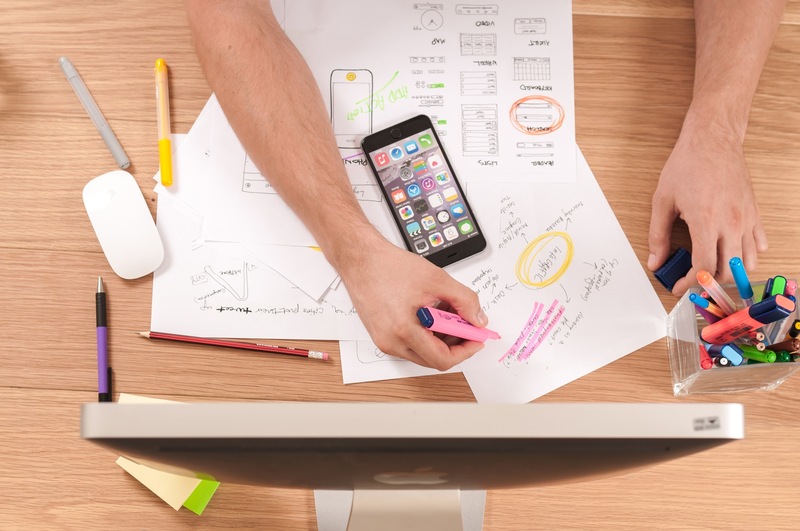 Converting ecommerce navigation should let users find products as quickly as possible. When the navigation is confusing and consists of a lot of options visitors often just exit the website. GolfOnline.co.uk did a great job. They are a niche ecommerce site and they are taking advantage of that fact. Pictures near categories make it easy to catch a category name quickly. 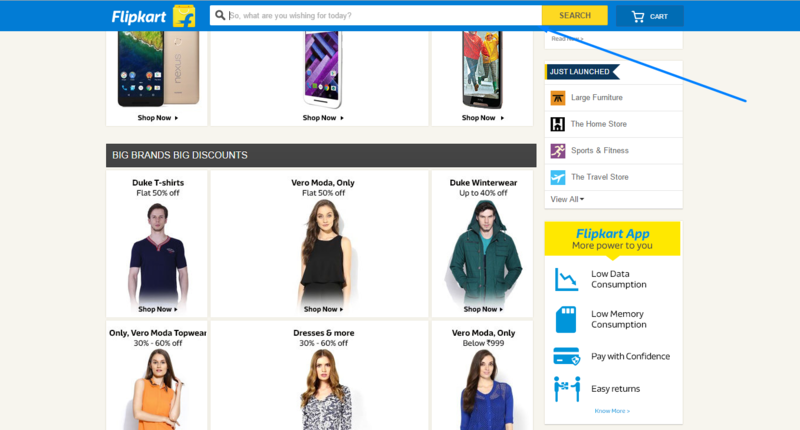 You can also select browsing by brand or by clearance. 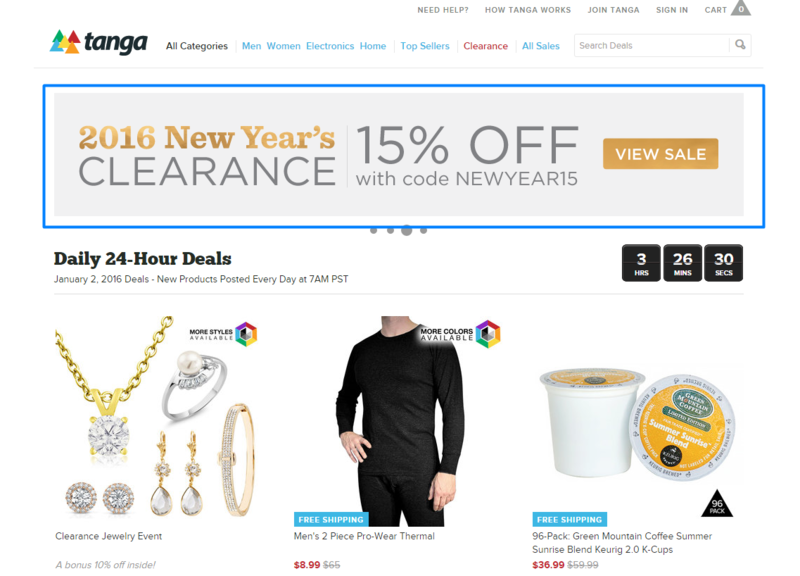 By the way, clearance or discounted products are a “must-have” for the majority of ecommerce sites. There will always be discount seekers who only buy sale products. Backcountry is one of my favorites in ecommerce UX design. Although they have a large number of SKU’s, the company has categorized them well. Firstly, the site features a search box as the company clearly understands that it converts better than categories and it’s easier to find a product there. Secondly, their categories and parent categories are well separated. It is very important to contrast the hierarchy. The main goal of this article is to retain customers. Once you are starting to get the results and users are becoming more loyal, update them with new products. They’ll get the opportunity to check out what has arrived since their previous visit. This is especially relevant to the fashion, kids and electronics niches, as their users usually look for “the latest thing”. When shopping, users have requirements for products they are looking for. While the user is in search you have a mission to select only relevant filters according to each search query; in categories this is easier. Assign relevant filters to each product category, give each product attributes and you have good start. Learn from top internet retailers how filters should be placed and announced and you’ll have a powerful tool for retaining your users. Zoom in & out plus high resolution imaging should be properly maintained. 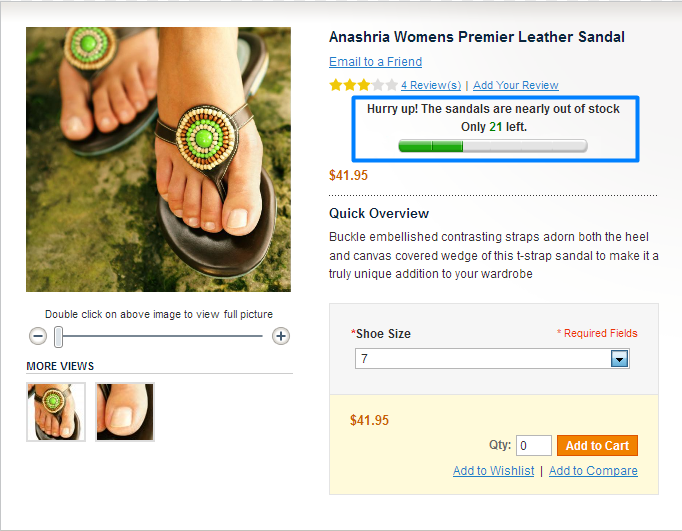 They give users better visibility of every product detail. Whether it’s fashion or an electronics store, this is relevant for the majority of categories. 360° product view. Like zoom in & out, this facility engages users, providing a more natural shopping experience which helps to persuade users. It gives a feel to the user more like a transparent store and when the product is delivered it will be as portrayed online. Proper description. Make sure the description answers all potential questions and overcomes possible objections. Moreover the copy must be compelling. We spend some of our valuable time making purchasing decisions. Sometimes it’s 10 minutes, sometimes two hours – or even more. So what if after a few hours or days you receive an apologetic message advising that your purchased product is no longer available? After such experiences, don’t expect much in the way of customer retention. People naturally fear trying a second time at the same store after this type of experience. What if it were to happen again? Therefore make sure your inventory has real-time tracking and updating across all your selling channels. One of the last steps for users when they have found a product, compared it and decided to buy it is the checkout. It should be as easy and understandable as possible. 68.55% of online shopping carts are abandoned. This means that out of 100 decided shoppers, 68 of them leave the store. Oh God…! Checkout. 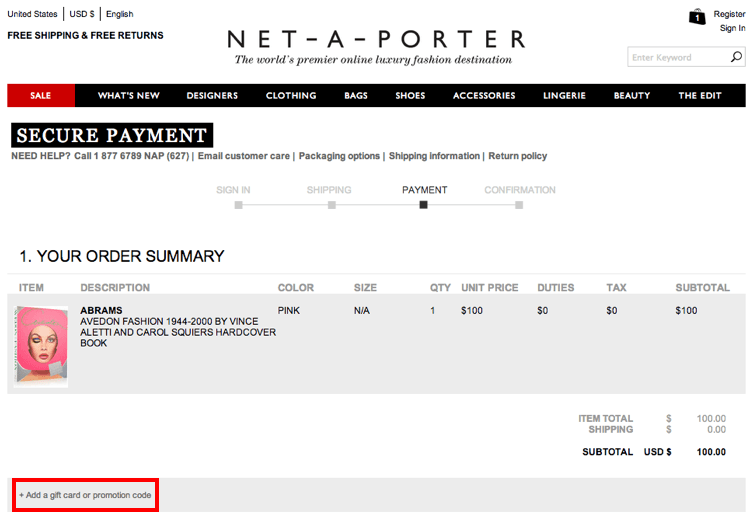 What happens after clicking “add to cart”? The moment a user clicks the “add to basket” button, it should feel obvious that they have added something to the basket. I am surprised how many stores screw this up either by not showing a tiny animation or displaying a proper confirmation. You should have a page where users can see all the information about added products. It should be easy to remove or add new items, and change the size, color or any other attribute. Prices and discounts should be defined clearly as well as shipping and returns information. 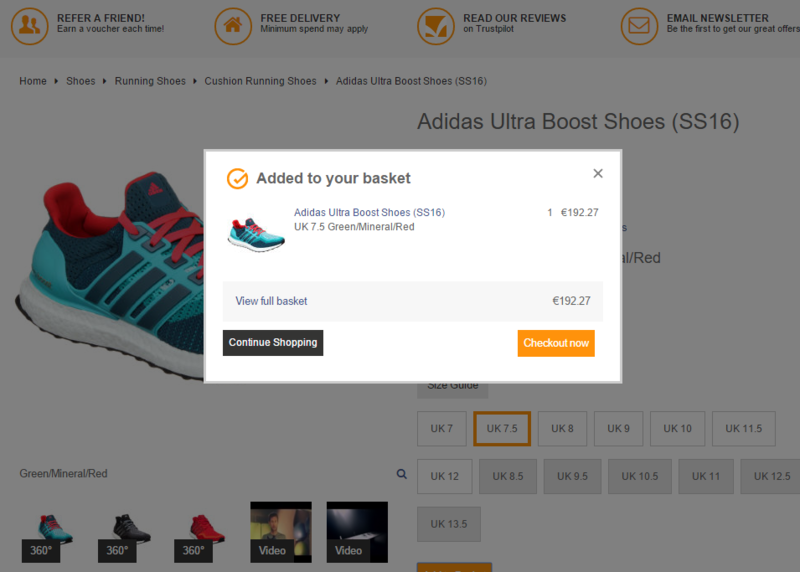 Moreover, remember the clear and big CTA (call-to-action) button leading to the checkout! 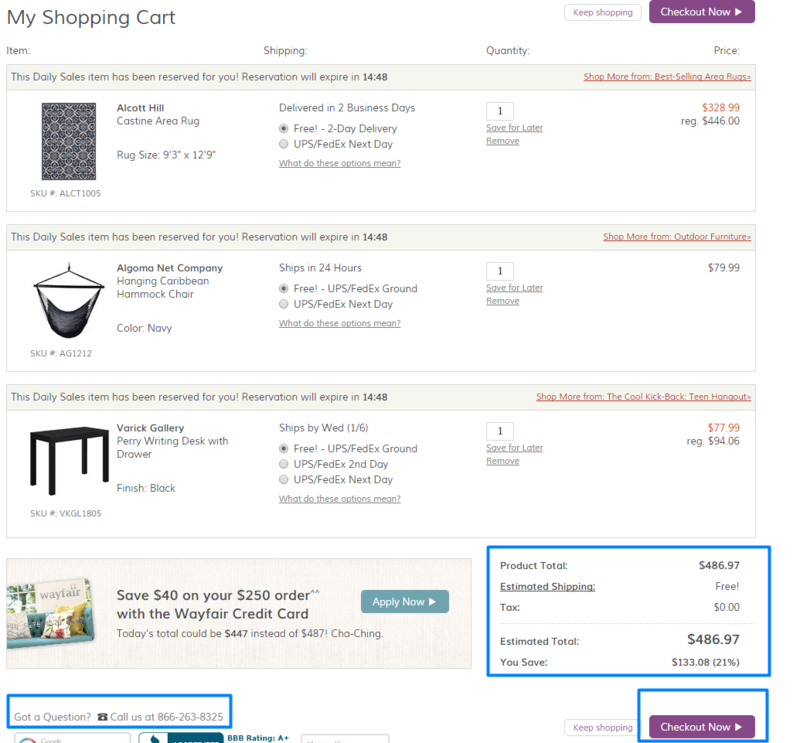 Wayfair.com is going to the right direction but still some details are missing. It’s impossible to change the color or size of the product without leaving the page. Also there is no information about returns which is critical to “minimize risk” for the buyer. 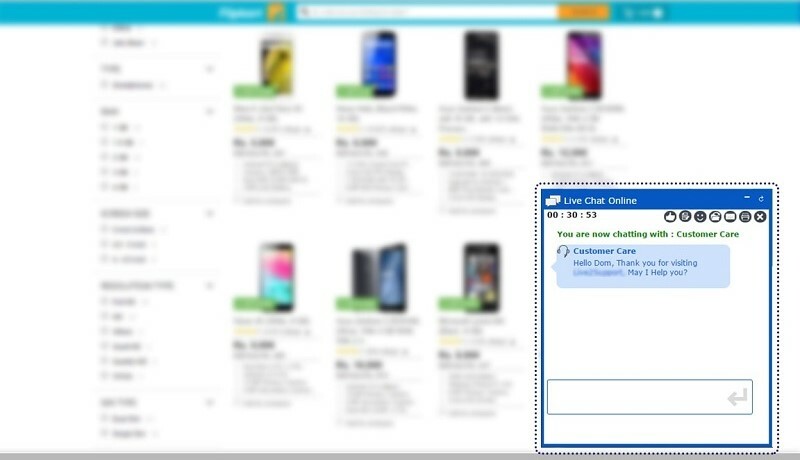 Fortunately they offer phone support in cart page, which sometimes answers some customer’s questions. A large field plus CTA for coupons could be dangerous when the user does not have a coupon. They feel like they have missed out somehow. Often such users abandon the cart because they try to find some coupons on Google, through friends or somewhere else. This is the easiest way to lose a customer. Instead of a big “Enter your coupon” field, carefully place a small “Have a coupon?” button. When it’s clicked then a text field opens. 1 in 4 abandon online purchases due to forced registration. So offer both options. You can also offer a discount if people buy as registered users to get their email address. Let the user firstly add the shipping information before they get to the billing. Ideally you’ll get the billing address, name and the email from this. So there’ll only be a few final fields to complete. So start from the easiest and end with the most difficult information. People tend to finish what they’ve started and this works well at the checkout. Make it not only look secure, but also work securely. Get SSL and inform users about it. Shopping cart optimization is a process with a lot of tiny details. I love this and this article which help to understand and learn about the process from A to Z. If your online store isn’t optimized for mobile devices, get ready for a lot of rejection. 30% of mobile shoppers abandon a transaction if the shopping experience is not optimized for mobile. Since 8% of users cited slow-loading pages as a key reason for abandoning their purchase, ecommerce site owners must make sure the site works smoothly. Users are not going to come back when shopping is so time consuming. Once the user has browsed the store, found and selected some products, they usually start interactions with the customer service. This is why it is rated as the second step in ecommerce customer retention strategy. 89% of shoppers have stopped buying from online stores after they’ve experienced poor customer service. (RightNow research). And that really makes sense. If you are not treated well by people and businesses with no integrity, why should you come back? 31% of online shoppers from both the US and the UK say they’d be more likely to purchase after a live chat. A live assistant who answers all the questions is always the best option. When you are a small-medium ecommerce site, you can handle it. Select smart software, have dedicated staff and treat your customers with integrity and a willingness to solve any challenge they face. Moreover, some people prefer talking than texting. Always show the support number at the top of the website so that users can easily call you and discuss their issues. Lastly, I personally believe that informal conversations win customers in ecommerce. Of course it depends on the person, but the majority usually prefer “Hey, Kevin!” instead of “Dear Mr. Kevin Seraphine”. Once the money has been transferred, the user wants to track and receive updates about the ordered product. The after-purchase experience is extremely important for the customer. Moreover it’s pretty easy for you as a business to show how much you care about the customer. Update your customers with any status change. The best channels for this are phone messaging, email or phone call. Additionally, take advantage of these messages as they have a higher open rate. Remind recipients about discounts and special offers, or ask them to refer your store to a friend. “Hey, Mike! Thank you for buying at [Store’s name]. I am your personal assistant Mary who will help you here with any questions. I just wanted to tell you that we’ve got your payment and the order will be ready for shipping in 24 hours. “Hey, Mike! It’s Mary from [Store’s name] again. I want to let you know that your order was dispatched 15 minutes ago. You should get it in three business days. “Hey, Mike! I saw you just got the order. I hope everything is OK with it. Let me know if you have any questions or issues with it. Small gifts build relationships with customers. People naturally like surprises and receiving something for free. Depending on your niche and margins add some free gifts or simply print the coupon to show that the customer is important to you. 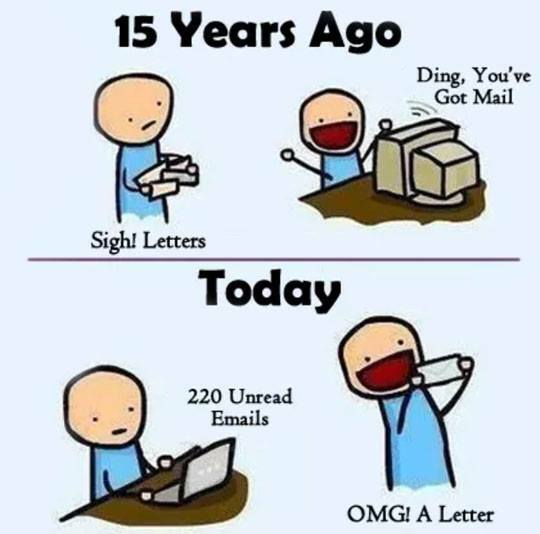 Moreover, personal handwritten letter works well. 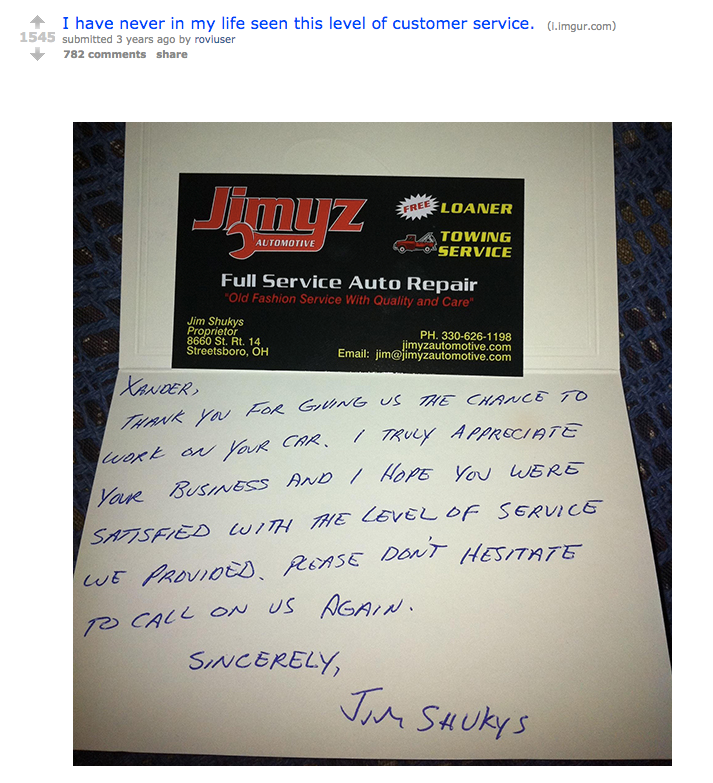 Honest appreciation shows how much you care and appreciate customer. One of the factors that discourage people from buying online is their inability to touch, feel and try the product. It’s just a photo, description, specifications and sometimes reviews. Faster decision-making process – more sales. Appreciation of free problem solving and feeling secure against buying the wrong item – customer retention and positive word-of-mouth. In these cases, remember to record the reason for returning, it will give you some insight into why it happened and what to do next. E.g. if the size is incorrect, offer a new size with no additional costs and free shipping for the return of the original order. 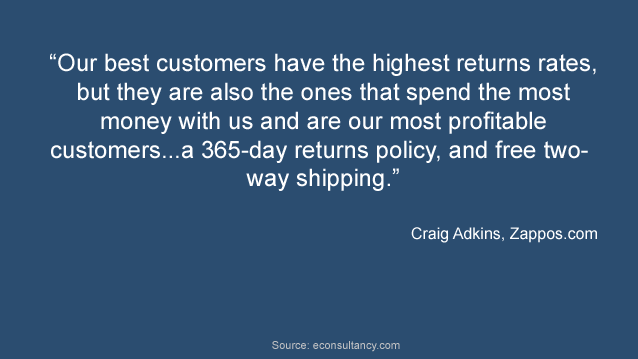 You’ll collect great data on why your users are returning products and you’ll be able to reduce return rates. When you create perfect website usability and serve your customers well they tend to return and also tell their friends about their great shopping experience. Take advantage of it; encourage them to buy again and tell the world how awesome you are. Without the basics – usability and customer service – none of the retention marketing activities will make sense. Your users will simply ignore you and remember their poor shopping experience. In this email-marketing era, we receive tens or even hundreds of emails every day. Back in the day, we were happy to receive emails, right now we are happy to receive personalized offline mail. No, it’s not about mass flyers or bulky mail-order catalogues. It’s about offers personalized to the customer with special limited vouchers. Let’s call it Direct Mail 2.0. Send well-designed direct mail to their home address with warm and short messages. Also add a voucher code to encourage them to buy again and use the code to measure the effectiveness of such mails. Use this method for dormant or lapsed customers. They usually convert well after such mail-shots. Moreover, try to market to other segments and measure how they convert and react. Your mission is to know how to be in the right place at the right time when the customer wants to buy something. If you crack the purchasing pattern – expect great conversions. The first and the easiest way to understand when customers are going to buy something again is simply by asking them. Many customers will be willing to tell you – usually at the checkout. Just make sure you motivate them. The best motivation is to clearly communicate that you don’t want to disturb them, you just want to make your relationship more effective. Secondly, if you sell consumable products, try to predict or calculate when customers are running out of them. Thirdly, update them when the new or updated version hits the shelves. For example, if I bought a book by J. K. Rowling and today her new book is published, I would love to get an update about that fact. Or if you have identified your customer as an Apple lover and Apple has just launched a new product, notify them and take advantage of it. This depends on your niche. If you are a retailer in fashion, homeware, beauty or furniture, visual social networks like Instagram or Pinterest should work well. Many retailers see a lot of repeat engagement through inspirational photos on Pinterest and Instagram. Users identify it more as an inspiration source and less as marketing. So stay in touch with your customers through visual inspirational channels like Pinterest or Instagram. Many first time buyers choose to buy as a guests. Creating an account often seems to be too serious a commitment for a first time purchase. You as a retailer can gain a lot of advantages from registered users. You can track their browsing behavior, purchasing patterns, and communicate with them via email or even phone and so on. So how do you encourage them to create an account while not hindering the conversion rate? After payment is complete I offer to take them to a page where they can create an account with one click. Moreover, I offer something in exchange to encourage them. This will give you more registered customers, which will lead to better communication and analysis of behavior. Reward programs have always been one of the most popular retention marketing activities – because they really work. The practice was started over 100 years ago and it is still being used among ecommerce businesses. It works simply – the customer gets a reward (points, actual store’s money, gigs etc) in return for some kind of activity (purchase, registration, referral, sharing etc). So the customer is motivated to perform your desired activity because they know they will be rewarded. I’d recommend using a SaaS tool to automate this system. For small-medium ecommerce sites this will make it much easier than maintaining your own rewards structure and software. Email newsletters are still one of the best converting channels in ecommerce. It is a critical tool for building relationships with your customers. According to KissMetrics email marketing has an ROI of 4,300%. And that tells a lot. This topic requires a separate post, but this post wouldn’t be the ultimate guide to ecommerce retention if I didn’t mention its main points. Make sure you segment customers. Those users who like or follow you on social media tend to follow your brand and even advocate. Build relationships there – this is the key to ecommerce customer retention. First of all social media channels are not just for promotion, they are also for customer service. Consumers aged 18 to 29 use a brand’s social media site more for customer service interactions (43%) than for marketing (23%). Additionally, reply time to customers on social channels should be no more than one hour. Secondly, if you’re looking for the best time to post your tweets, posting one to four times from 1pm to 3pm may be your best bet. Facebook is a different matter altogether: Facebook posts peak around noon and after 7pm – people log into their accounts during lunch breaks and after work. 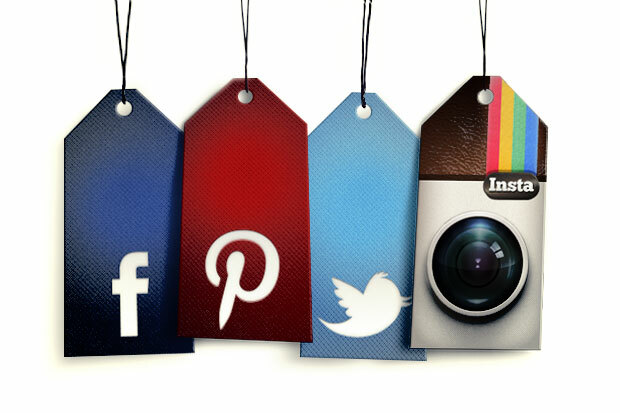 What should online stores post on Facebook and Twitter? Finally, don’t forget Quora. Answer the questions in your niche and refer users to your blog and store. For example, you are selling camping gear. A Quora user is asking which sleeping bag is the best for camping in the mountains. Write a detailed answer and insert links to your store or blog. I notice that more and more ecommerce companies are using Quora as one of their social media channels. 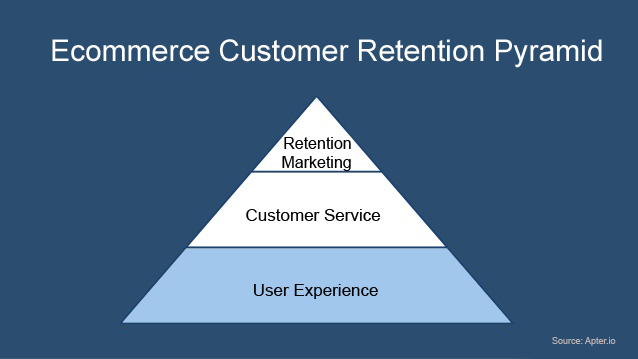 Customer retention is the key to winning at ecommerce. Take it seriously, execute it effectively and expect predictable revenue from existing customers. What’s your approach to retaining customers? Please share in the comments your thoughts, insights and lessons.